When I drink cognac it is generally in a snifter, held lovingly in my hands to warm the spirit and sipped slowly over a period of time while reading a good book or just relaxing and letting the day wash away. That's when I pull out my hidden bottle of $500 Cognac and pour in some "me day" adjustment. I hoard this like a miser hoards gold. I do however enjoy it's addition to a cocktail now and then but, let's be honest here, I'm not adding in a cognac that literally costs more than a pair of mid range Manolo or Jimmy Choo shoes. I generally stick to a lesser priced cognac for the purpose of cocktails, usually Remy Martin. (I like expensive shoes and I like expensive cognac and my budget doesn't allow me unlimited supplies of each, sadly.) But Remy is a very respectable cognac, mixed in or sipped. You, depending on your income tax bracket, may use whichever price of cognac you prefer. Just remember that a cocktail is only as good as all it's ingredients. 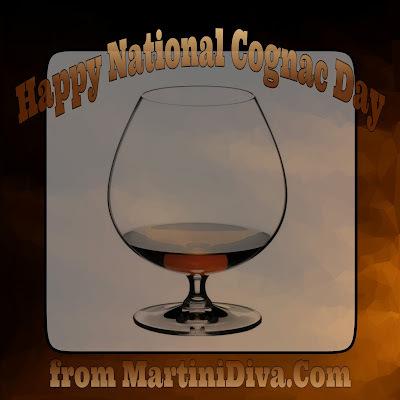 National Cognac Day is June 4th.